Frankly speaking it's good to have a wife. Especially a wife that finds an old (but operational) Amstrad-Schneider CPC 464 (64k Colour Peronal Computer) at the bottom of the wardrobe. And so, a new toy came into my possession (great! another architecture to play with ;D), and most definitely few random future posts will be about it. 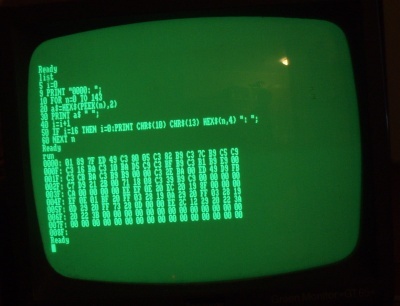 If You want to write a program on CPC 464 (or Atari 800 XL, or Commodore 64, etc) You have to turn it on. If You want to write a program on a PC, you have to turn it on, wait a minute or two as the OS loads, find a page with some interpreter/compiler which interests You (if You don't have it already), download and install it (checkout downloading MinGW compiler and You'll get the idea what I'm talking about), run an editor/IDE, download some tutorial which will tell you which one of the 100 buttons is "compile" / find a tutorial that will tell you how to compile or run the program, find a tutorial that will tell You what libraries/headers should be included/imported, etc. Yeah, I'm over exaggerating. But then again, not that much, not that much at all. Todays computer systems are tens of thousand times more powerful then the CPC 464 mentioned earlier, but most of this power is used for making the life simpler for newbie users, or to put it in another way - to make life more miserable for newbie researchers/programmers. Well, is it an even trade? - CPC 464 has a FDD 3' (yes! 3', not 3.5'). I've read in a few places that the controller of this FDD is the same as in standard 3.5', except for some fancy features like DMA - so using a simple adaptor with a few crossed cables allows You to connect 3' to a PC, or 3.5' to CPC (another think is the lack of DD disks on the marked ;p). - CPC 464 is powered by a RISC Z80 processor (Zilog 80). - From BASIC (Locomotive Basic 1.0 is used here) one can call any address in memory (where some machine code is placed) using a CALL command with a memory address.